We provide your information (including your standard pricing) to our owner/builder clients in your local area. You work directly for the client on a contract basis. Ideal for Riggers, Carpenters, Plasterers, Electricians, and Plumbers. Naturally, only reliable tradesmen with a high standard of workmanship need apply. Join our network of licensed builders offering to build Ezy Homes to completion throughout Australia. We provide the clients, and can even take care of the quoting for you – using the pricing you provide for each of our standard designs. This business model allows you to spend more time building (making money) and less time advertising, quoting, & chasing work. Build one Ezy Home and you’ll find it hard to go back to the old (slow) ways. 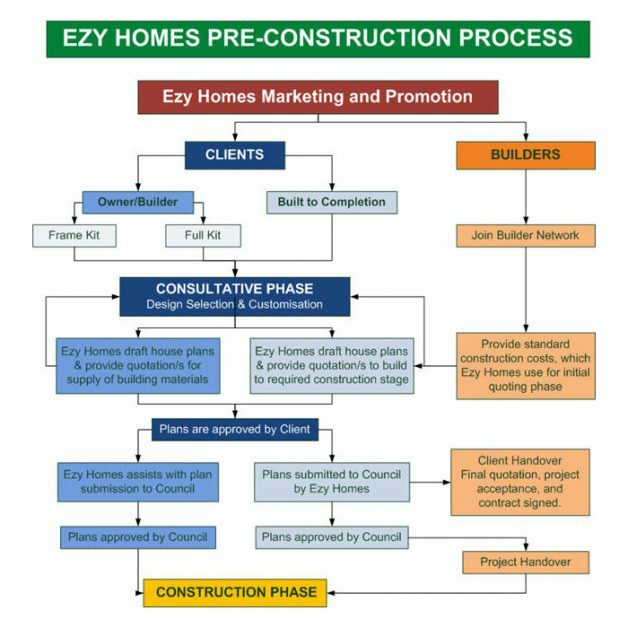 Choose Ezy Homes as a primary supplier for your own clients and become an Ezy Homes Premium Partner. Premium Partner’s have the added benefit of targeted marketing in their local area and volume based buy-breaks. Ezy Homes will help you grow your business – AT NO COST TO YOU OR OUR CLIENTS. Ezy Homes DO NOT require our building partners to pay a finders fee, marketing fee, or any other fees that would result in an increased price for our clients – unlike some companies. We take care of the Design & Engineering, Marketing, Quotes, & Supply – allowing you more time to do what you do best. As well as construction manuals, tech sheets and fixing schedules, Ezy Homes offers it’s construction partners full support and personal back-up. Our staff are available literally 24/7 to answer any queries that may arise. More than just regular chippies, our construction support staff have highly intimate knowledge of Ezy Homes construction methods and have established the most efficient techniques for you to use.